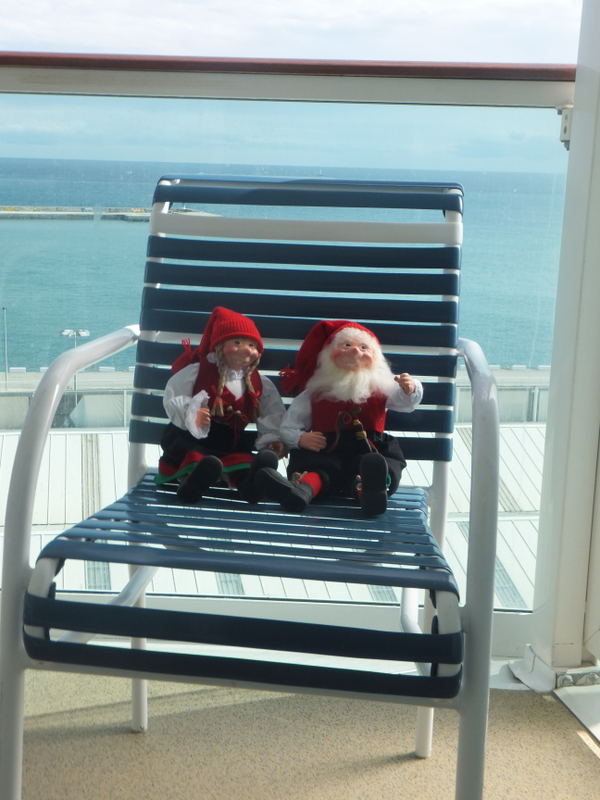 Lena is enjoying the nice weather in Tenerife, (she forgot her shorts and bikini) - it is around 77 degrees on the balcony! Hope you, Deb and Matt is doing ok after Sandy's visit!! See you soon! On our way - really! After some hours in the suitcase, we got to see our new home for the next 2 weeks! Wow! This is really going to be a great way to travel across the pond, and then to meet our new landlords, Debbie and Matt.... Hope they accept that Ole likes a glass of mjød once in a while, as all Nissemenn does! 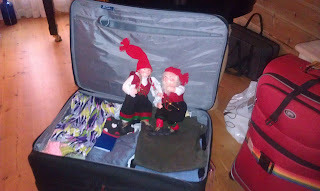 Ole and Lena will be travelling in our carry-on - they are pretty fragile (made of som sort of porcelain). 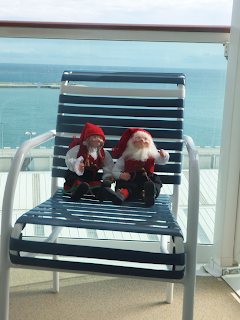 And - I will try to take a picture of them on the plane! Hope they like flying! 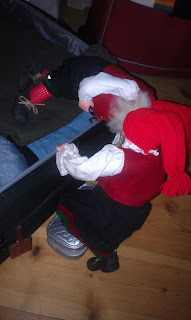 Ole wanted to try how it felt in a suitcase, so he helped himself and Lena in to one of the big ones just to see how it felt. One- to- three come on! There we are!! Yes - this feels comfy. 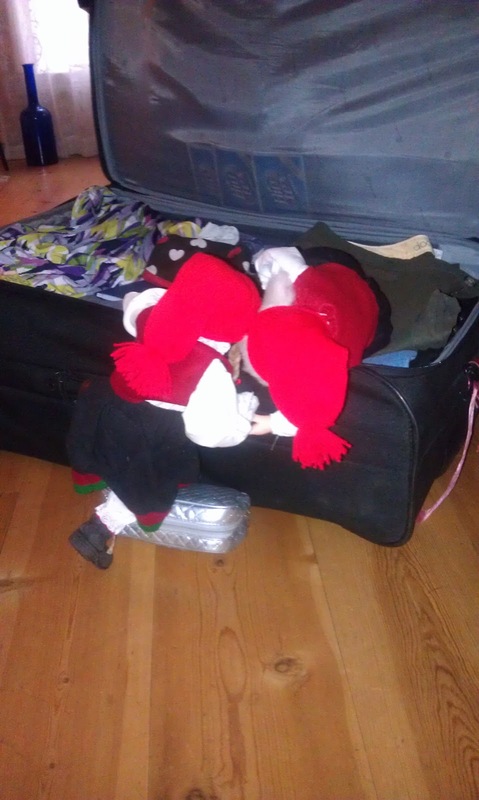 Actually better than in the carry-on. Filled with cameras and other hard stuff! Ok - we are ready! Let's go! 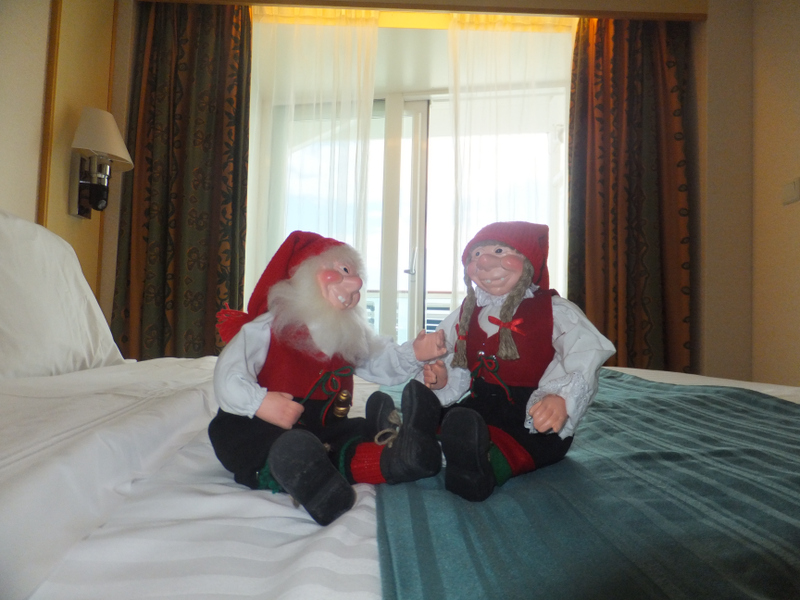 Ole and Lena have started their preparations for the Transatlantic crossing on Liberty of the Seas October 27th. With 14 days of cruising, lots of stuff has to be fixed and done. But, Lena is rather ¤%/#!! at Ole right now, she HATES to iron but loves redwine... And what is Ole doing? 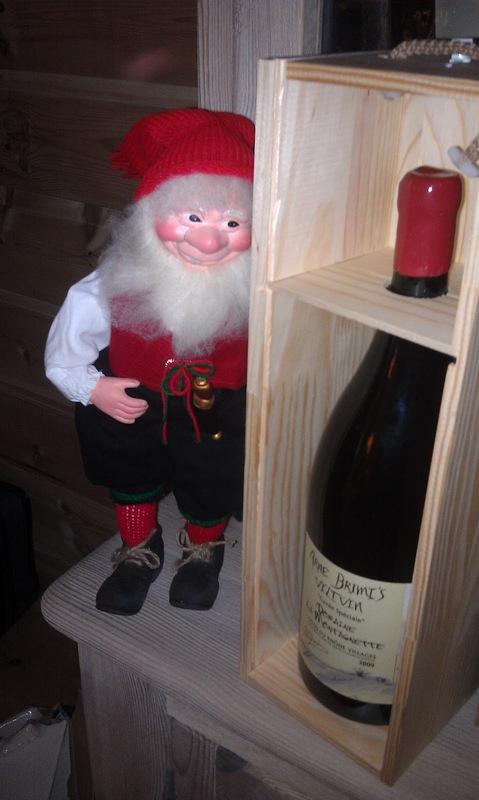 Hiding behind the biggest redwine bottle in the house! Well - maybe Lena just "forgot" to pack some of his clothes, so he has to stay in the cabin while she is running around having fun on the ship? Oh yeah, just you wait, mr. Ole, just you wait! Ole and Lena - who are they? 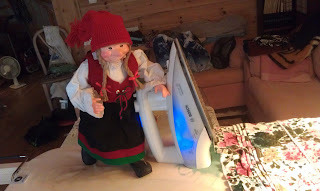 Ole and Lena (also Sven and Ole) are central characters in jokes by Scandinavian Americans, particularly in the Upper Midwest region of the U.S., particularly in Minnesota, Wisconsin, Iowa, South Dakota and North Dakota where Scandinavian immigrant traditions are common. We thought actually that the most common names in Norway were Ole and Kari (at least one hundred years ago) but then, many of the names from Norway - like Oline, Oleane, Caroline/Karoline and Lina, Nikoline and so on, would be easier in english as Lena. Kari was often translated into Carrie or Caren. Ole and Lena got married. On their honeymoon trip they were nearing Minneapolis when Ole put his hand on Lena's knee. 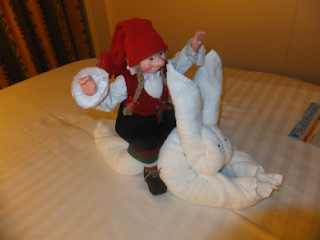 Giggling, Lena Said, "Ole, you can go farther if ya vant to"... so Ole drove to Duluth. As we love traditions and old stuff, we fell in love with this beautiful rocking chair, an engagement gift from Johannes Thorsheng (1897-1971) to his fiance Sigrid Gurine Olette Johansen (1899-1981). They got married in 1919.